Rahul Gandhi said the Yogi Adityanath government in Uttar Pradesh should not try to cover up the matter. 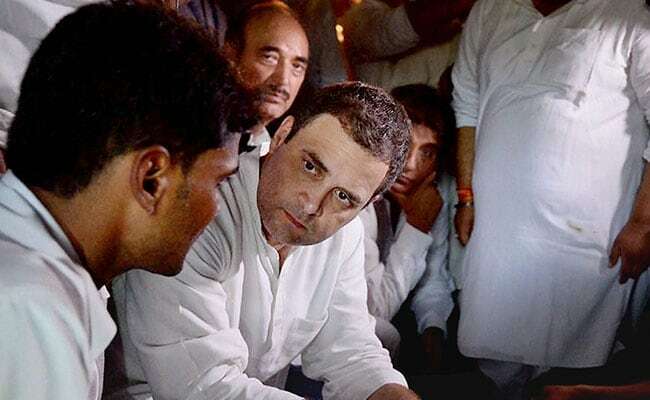 Gorakhpur: Terming the deaths of scores of children at a state-run hospital in Gorakhpur as a "government made tragedy", Congress Vice President Rahul Gandhi on Saturday said that Chief Minister Yogi Adityanath should not try to cover up the matter. "All those whom I met told me that oxygen shortage led to the death of their children. Many families were given ambu bags (a manual resuscitator) and they pumped it for hours...It is very clear that it government-made tragedy," Mr Gandhi said. The government should take action in the matter and not try to cover it up, he said. It is absolutely clear that oxygen shortage and laxity were the reasons behind the tragedy, he told reporters after meeting family members of the victims. "The chief minister should not try to cover up (the matter) and action should be taken against the guilty. This is my message," the Congress vice-president asserted. Mr Gandhi said that he had visited the BRD medical college and hospital here earlier as well and had told Prime Minister Narendra Modi through the media that it needs funds as there were too many shortages. But no action was taken, he rued. There have been scores of encephalitis related child deaths in the BRD medical college hospital in recent days triggering a nation-wide outrage. "Modiji speaks of a new India. This kind of new India we do not want. We want hospitals where poor people can take their children (for treatment) and come back happily," Mr Gandhi said. He complimented the media for raising the issue. "I want to thank them for this (highlighting the issue)...it is not a matter concerning Uttar Pradesh but is a national tragedy. It is indicative of the health care of the country," he said. Earlier in the day, Yogi Adityanath also had hit out at the Congress vice-president over his visit here, saying the 'yuvraj' (prince) sitting in Delhi cannot make Gorakhpur 'a picnic spot'. Mr Adityanath, who launched a cleanliness campaign in the district to tackle the deadly encephalitis outbreak in the wake of death of 71 children at the BRD in the town, also hit out at his predecessor and Samajwadi Party chief Akhilesh Yadav. "I feel that the shehzada sitting in Lucknow ..'yuvraj' sitting in Delhi will not know the importance of this cleanliness campaign. They will come here to make it a picnic spot, we cannot permit it," the chief minister had said, before the Congress leader's visit to Gorakhpur to meet the families of the victims.